I look up at the wall next to one of the outdoor lights last night, and notice this beautiful little creature. 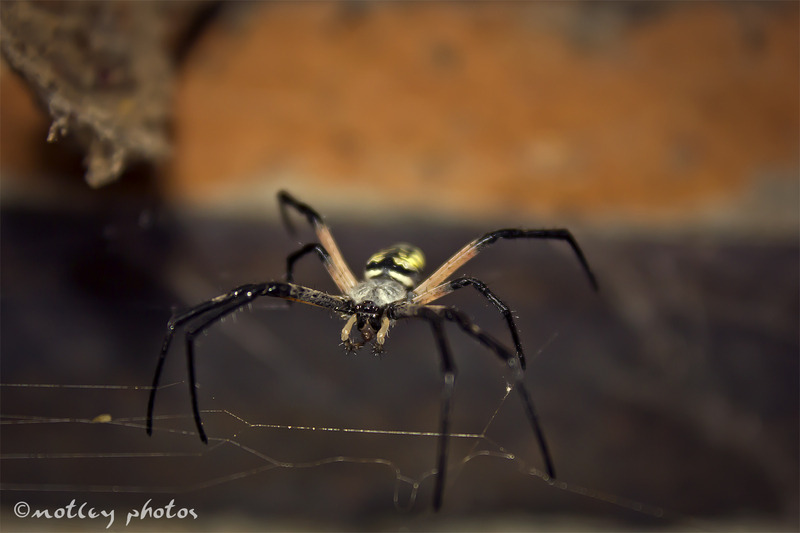 She is approximately three inches (leg span) and quite colorful. 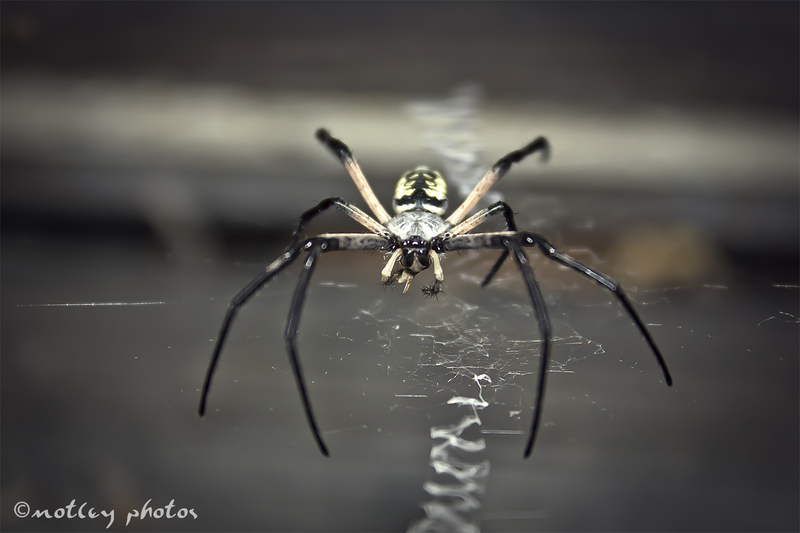 I am not a fan of arachnid’s, nor any insect for that matter, but seeing that she is a Black-and-Yellow Garden Spider, Argiope aurantia, and helping to catch bugs, she is more than welcome to hang out – literally. Click on any image to view in full size. Hit your back button to return to this post and photos. I don’t like spiders inside, but watching them work their webs outside is fascinating. It’s something I always point out to the kids on nature hikes. It was working it’s web last night, and the movement was making it bounce up and down similar to a trampoline. Unfortunately, due to the lighting, I couldn’t see the web strands – I could just see her (him?) moving and working the thread with her legs. 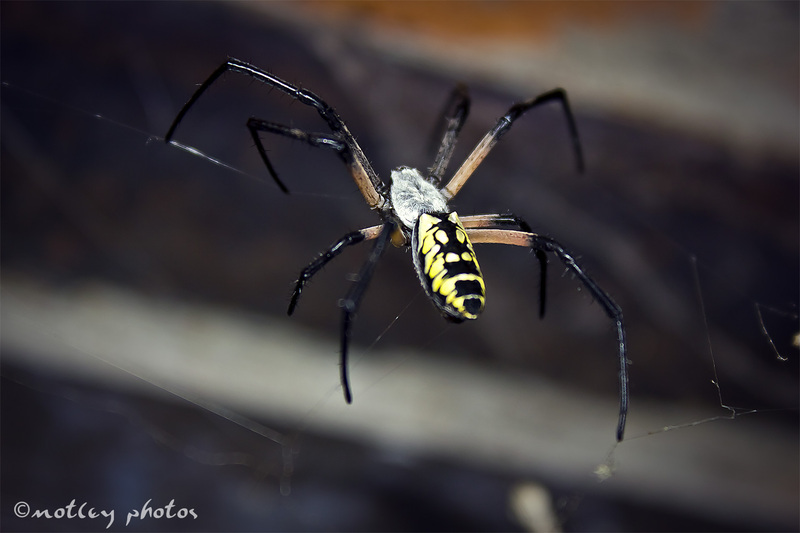 Spiders – totally cool but they give me the creeps! I too love to watch them do their web work – as long as it’s outside and not in the corner I need to reach into! 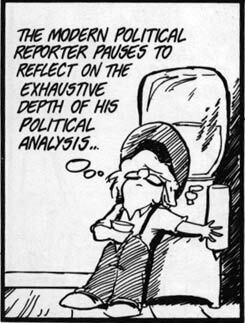 eeeyewwww…. that image gave me the heebie-jeebies for some reason. I’m not scared at all of bugs, insects, arachnids, etc. and sometimes find them fascinating – outside, of course – but for some reason, that image made me shiver. Maybe those long long legs…. Because you can see the hairs and little spikey things on it’s body. Hmmmm.. you have a point ! And so does this girl… all over her legs. haha !! watch out for my 1500 Saturdays post ( will be in the morning) as you are getting a mention and a point to your blog 😉 … it’s gonna be a guns thing ! Uh.. oh……. 😆 looking forward to it.